Scientists at the U.S. Department of Energy's (DOE) Brookhaven National Laboratory have completed the first "science raft" for the Large Synoptic Survey Telescope (LSST), a massive telescope designed to capture images of the universe like never before. 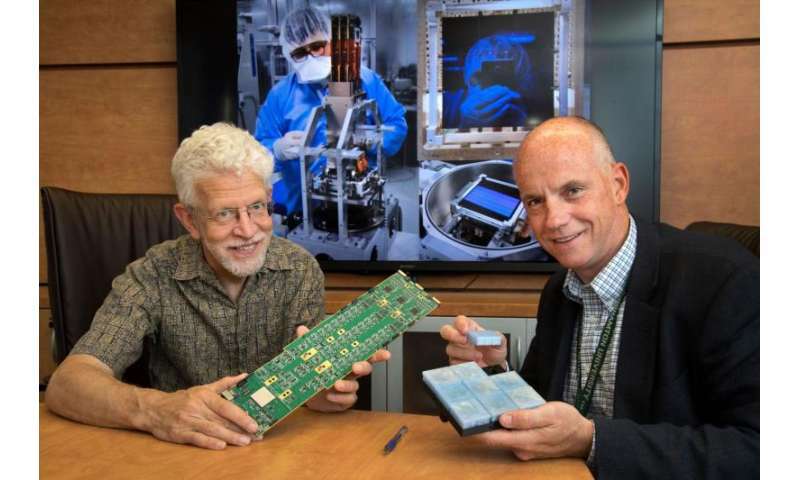 The raft is part of the sensor array that will make up the crucial camera segment of the telescope, and its completion is the first major milestone for Brookhaven's role in the project. The LSST project is a collaborative effort among more than 30 institutions from around the globe, funded primarily by DOE's Office of Science and the National Science Foundation. SLAC National Accelerator Lab is leading the overall DOE effort, and Brookhaven is leading the conceptualization, design, construction, and qualification of the digital sensory array, the "digital film" for LSST's camera. "It's the heart of the camera," said Bill Wahl, Science Raft Subsystem Manager of the LSST project at Brookhaven Lab. "What we're doing here at Brookhaven represents years of great work by many talented scientists and engineers, which will lead to a collection of images that has never been seen before by anyone. It's an exciting time for the project and especially for the Lab." LSST's scientists have designed a grid composed of more than 200 sensors, divided into 21 modules called science rafts. Each raft can function as a camera on its own but, when combined, they will stitch together a complete image of the visible sky. After years of design and construction, the first raft was qualified for use in the LSST camera in late May 2017. Brookhaven is now scheduled to construct approximately one raft per month. "Completion of the first raft is a big stepping stone," said Paul O'Connor, Senior Scientist at Brookhaven Lab's Instrumentation Division. Scientists at Brookhaven have successfully captured high-fidelity images using the newly completed raft, confirming the functionality of its design. The science raft "is an object that is tricky enough to build alone, but it also has to operate perfectly when in a vacuum and cooled to -100° Celsius," O'Connor said. Cooling the rafts improves the camera's sensitivity; however, it also causes parts to contract, making it increasingly complicated to design the rafts precisely. "This is what a lot of people would say is the most pressing question of fundamental physics," O'Connor said. "The nature of dark energy and dark matter don't fit into the rest of physics."